I don't know if every gardener would agree, but for me, winter is the busiest season. I have been lost in the garden; busy with pruning, mulching and generally tidying up. A winter garden is often dull and uninteresting because so many plants are in dormancy. Over the years, I've intentionally searched for winter-flowering plants to brighten up the dull spots and challenge the gloom. I found this sweet little gem, unlabelled, in a toss-out bin and it has become a winter favourite. I think it is a cuphea. Cuphea hyssopifolia 'Rob's Mauve' (below) is as common as muck, but it earns its place in the garden for its prolific winter flowers. It is a great filler for arrangements too. While I'm not a huge fan of pelargonium/geraniums, Perlargonium hortorum 'Rose Mega Splash' is very pretty right now. ... As does this little yellow buttercup that pops up out of nowhere at this time of year. I don't know what this plant is. It came from my Mum's garden, and dies back for most of the year until its fleshy foliage emerges in the winter. Please tell me if you know its name. Even some of my verbenas are holding up to the cold weather, and sending out defiant blooms. This is Verbena 'Twinkle Crimson'. Of course, some of the winter bulbs are starting to flower, with the appropriately named Jonquil 'Erlicheer' leading the charge. I am very excited about seeing the blooms of this little plant for the first time. It is Leucospermum glabrum x tottum 'Carnival Red', planted last September. While I continue to search for winter blooms, it is this time of year when foliage can take more of centre stage. I love this variegated euphorbia and how it contrasts with the dark green of the oyster plant. 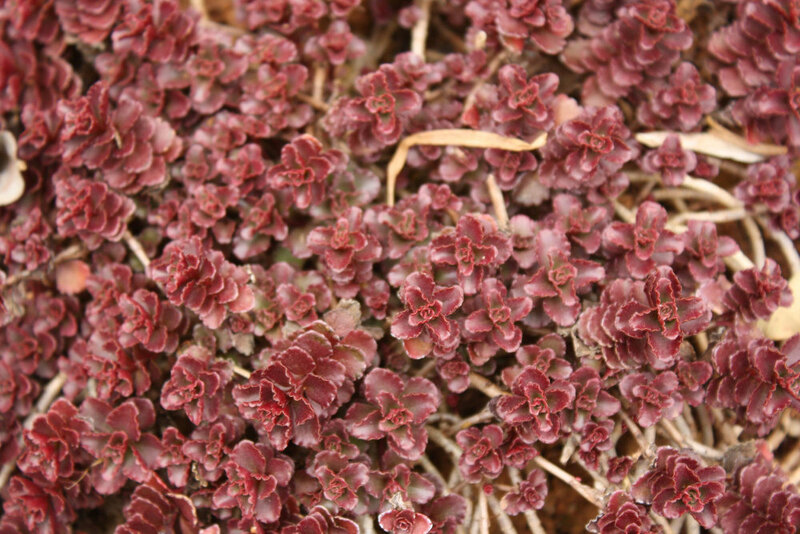 Sedum spurium ‘Voodoo’ gets to strut its stuff, with its tiny burgundy leaves. I've tried over the years to create contrast in plant colour and form in my garden. (Yep, more garden nerdiness right there!) I feel like I'm slowly getting somewhere. Even after the winter pruning, I am starting to see different shapes emerging; spheres, cones, spikes, etc. Any gardener will tell you that a garden is never finished. It is constantly evolving, as plants grow too big, or die, or clash badly with others around them. This isn't a failure on the gardener's part; merely an opportunity to plant something else! The garden below is 12 months old. We had to pull down three enormous Leighton Green conifers because they were diseased. They left a gaping hole in the garden, but with it, a whole lot of new sunshine and a chance to plant new things.